"Despite an increase in applications, the "Pre-A" Porsche 356 meeting in Saarbrücken, Germany, on September 6th was limited to just 22 cars. Coming from Switzerland, Italy, France, Luxembourg, the Netherlands, Spain, Belgium, The UK and Germany, the Porsches drove to Luxembourg the following morning for a farewell lunch." 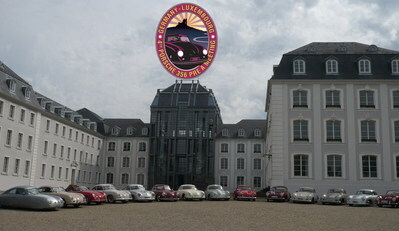 2nd car from bottom is our President's '51 Coupé, the oldest Porsche registered in Luxembourg. "Oldest participant, and much admired by local enthusiasts, was a 1950 model from France. Among the Stuttgart bunch was a totally original 1955 coupé, while one British Speedster braved the rain with minimal weather protection."